God has such a sense of humor, doesn’t He? As young adults, we think we have our lives all planned out, and then He sends us down paths that we had never intended to explore. One of those paths for our family has been caring for adult relatives. Over the years we have provided short-term or long-term care in our home for five different adults. I find this amazing because both my husband and I are very private people and we did not inherit the hospitality gene. Hmm . . . this gives credence to the verse about God working best through weak people doesn’t it? In Home-Based Eldercare you will find stories, strategies, and encouragement for your own journey in caregiving. You may be caring for one or both parents, or perhaps your spouse. Maybe you are looking down the road and just want to be prepared. Each caregiving situation is unique because each caregiver, each patient, and each health situation is unique. Family dynamics, finances, personal health, and temperament all play into how caregiving will look for you and your loved ones. I pray that this book will encourage you as you care for your loved ones. One by one, family by family, let us restore a culture of caring—one that celebrates life from conception to natural death. She tended you as an infant. He taught you to ride a bike. Now that loved one needs your help. Marcia Washburn guides you through the spiritual and practical aspects of eldercare. Marcia reveals the tenderness and love that is nurtured as we care for those who need our help in the final chapter of their life's journey. If you're in need of a practical blend of God’s word, stories and tips, this book will be a valuable resource. This book is a must read for anyone who is presently caring for a loved one or who may in the future. It is both professionally and endearingly written with a wealth of information. The material in the Appendices is especially valuable. I laughed, then I wept as I remembered my own mom, tears of fondness that I sometimes forget. Stories and & Strategies for Caregivers is definitely a must-have for beginners doing first time caregiving. Out of a heart of love and one of a servant, may God bless all those who are selfless enough to meet this rewarding but challenging task. I loved Marcia's book. My life is busy with caregiving, period. I assist my 18-year-old son at home with Muscular Dystrophy and also . . . assist my 92-year- old dad who still lives in his home. Some days my life feels very overwhelming. Marcia's book has widened my eyes to what we need to get in order both for my son and for my dad. I have laughed and I have cried . . . I so appreciate Marcia's wisdom and spiritual discernment. How wonderful to read a book [that] can put into language the 'groanings' of your soul and to have someone who has walked in similar footsteps. To say this book has blessed me is indeed an understatement. It provides we caregivers with the tools we need here on earth to do our jobs with greater ease and grace. A must- read for anyone who wants to care for any loved ones with greater skill, courage, love, and tenacity. This book is a must for anyone with aging parents or loved ones. The honest and practical advice will give hope to those caring for loved ones at home. Many times while reading, I wasn't sure if I wanted to laugh or cry while following along with her mother-in-law's dementia. I will be recommending this book for years to come. When I realized I wanted to re-read this book only two months after my first read, I knew I needed to share this gem with others. The author writes from a hands-on approach to the day to day challenges and smiles of caring for an elder who needs assistance. You are engaged in her real-life stories, both humorous and sad. She offers excellent tips, including my favorite about compiling a notebook of vital information for your family, including insurance and financial details, locations of wills and safety deposit box keys, and final wishes, before you die. This would be an incredible final gift to your family. I guarantee you will enjoy and find this Biblical faith-based book one that you will refer to over and over. Homeschoolers have discovered that family and relationships add important aspects to education which institutions cannot supply. Many families are now discovering the importance of family and relationships in the area of elder care as well. Instead of sending Grandma and Grandpa off to an institutional nursing home, many are choosing to provide care within their homes. 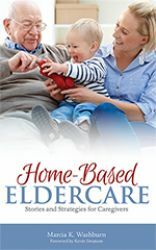 Marcia Washburn has personal experience caring for her aging and dying parents and has written a new book entitled Home-Based Eldercare: Stories and Strategies for Caregivers to help others with this important, God-given area of ministry. Marcia has cared for both a mentally whole parent and one who suffers from dementia and Alzheimer’s, and she addresses some of the challenges and concerns with both situations. While telling stories from her personal experience, Marcia gives advice on how to care for an elder’s personal and spiritual needs, how to prepare in advance for a hospital visit, how to handle finances, and how to care for the caregiver. One way Marcia found to minister to her parents was allowing them autonomy for long as possible. Allowing them choices about schedules, food, clothing, and family activities helped maintain dignity and respect as many other freedoms such as driving and living independently were slowly stripped away. I appreciated Marcia’s sharing how she’s discovered that a little forethought allows her to avoid unnecessary conflict and keep her household running smoothly. She shares many examples of how she handles doctor appointments, shopping trips, social occasions, and even laundry in a way that maintains a sense of comfort and security for the relative in her care. Much of her advice reminded me of how to keep a toddler from having a meltdown, and Marcia points out that there are many similarities between caring for a young child and caring for the elderly. This book will be an invaluable resource and encouragement to anyone embarking on the journey of home elder care. I really appreciated the vision Marcia casts of why this sacrificial ministry is so important, and I found the book convicting. I need to seek ways to honor my parents even if they don’t need my full-time help at this point. Our culture has lost its sense of duty toward parents, and we as Christians need to lead the way in reestablishing children honoring their parents and caring for them as they age. What a treasure of helpful information! Marcia Washburn has provided a wonderful resource for adult children who are called or may be called upon to care for their parents. Home-Based Eldercare is a user-friendly textbook that takes the reader from an inventory of things to know, things to do, things not to forget to chapters on specific subjects and needs. She doesn't hide the fact that eldercare is difficult. But, she does prepare us to anticipate the future reality and be ready to intercept it when it arrives. I would recommend this book for every church library and for every family. I would like to personally thank you for your book about eldercare. We cared for my mother-in-law for 6.5 years in our home. She had advanced Parkinson’s and dementia in the last 3 years. Your words were an encouragement to me during that time. We also had 9 children at the time, from 18 to 1, so you can imagine it was a stretching time in our lives. She passed away in our home last November. May the Lord bless you as you continue to serve Him. Marcia's down to earth style of sharing her experiences of caring for elderly family members in her home was heart warming and encouraging to us in our own similar situation. I already knew some of what she shared through my own "on the job training," but also learned quite a few new "tricks of the trade" from Marcia, especially learning to address issues in ways that maintain respect for my elder, and several other practical tips about managing medications, documents, and finances. The appendices giving help with organizing documents and a "go bag" for doctor visits were especially helpful. I plan to give copies to my siblings who are also providing eldercare in their homes. Excellent book! Very practical. Full of real-life, thought-provoking issues that we will be faced with should we be considering eldercare. I read it on the plane on a flight out to help my mom work through stroke recovery. I felt that it gave me a very strong foundation with which I could broach the subject of her living with us one day. This is a book I will read and reread as we continue to consider this very viable, God-given opportunity that many of us may have. Thank you for an excellent, well-written and easy read! Marcia Washburn has been known in homeschooling circles for a long time as she has authored a number of very insightful and practical books to encourage homeschooling parents to provide their children with a top-notch education. Now with her children grown, she has turned her focus to helping others do has she has successfully done during the past decade - care for aging parents in a home situation. Marcia has provided care for both her mother, who died after a long illness, and now cares for her mother-in-law who suffers from dementia. Marcia's loving kindness is matched with her excellent organization and communication skills, making this book very helpful and practical for the younger generation to care for the older generation following Biblical principles. She shares her life transparently and with humor, but also gets to the nitty-gritty of caring daily for bodies that are failing, and minds that aren't what they once were. This is a very good book for adult siblings to read and determine together what will be the best way to care for their beloved parents, while keeping them at home, instead of moving them to an institution permanently. Home-based elder has been happening for thousands of years, but for some reason 'enlightened' Americans have moved away from it. Be inspired that you and your family can do this, and do this well, and more importantly enjoy this special season in a multi-generational household. This book is a must read for anyone caring for aging parents or those with the possibility of doing so. The practical advice Marcia gives from her personal experiences as a caregiver is well thought out and invaluable to the reader. This book is easy to read yet thought provoking and encouraging. I highly recommend this book. At 14 most non-fiction books are tortue to read . . . I read this book to prepare for helping the author at a homeschool convention. At 14 most non- fiction books are torture to read but I enjoyed this book and read it in just a few days. A few years ago one of my grandmas had to stay with us and this book would have been helpful while she stayed with us for the short time she was there before she went home. I think that if you are going to have an elderly person in your home this book would be very beneficial in giving you tips to help both you and the elder adjust to the new arrangements. This book is excellent!!! Very detailed, informative, and encouraging!! I HIGHLY recommend it! !